The home of Tim Menzer burns in Choctaw, Okla., on Thursday afternoon. 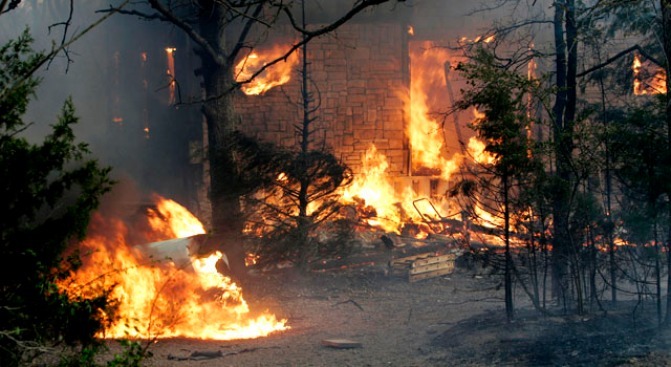 Gusting winds and dry conditions fueled wildfires across Texas and Oklahoma on Thursday. His house surrounded by a raging wildfire scattering embers everywhere, Fred Blackwell finally had to give up the fight and evacuate. The 40-year-old oil field worker hoped he would find his house intact when he returned, but he knew better. Sure enough, Blackwell's 1920s-era brick home was among dozens destroyed by wildfires that killed at least three people and scorched more than 100,000 acres of drought-parched Texas before high winds that fanned the flames eased Friday. Blackwell and other residents of tiny Stoneburg in the tree-dotted grasslands of North Texas were no match for the 60-70 mph winds that shifted and tore a blackened swath through the heart of town Thursday. A day after deadly wildfires swept through North Texas, residents in Montague county survey the damage and what's left of their homes. When Blackwell returned around sundown, what remained bore little semblance to the two-story brick structure that once was his home. "That rock was glowing," said Blackwell, standing amid twisted tin and mounds of ashes. "I knew everything else had been burned down because there was nothing else around it." Blackwell also lost a large workshop behind the house. "It tore me up," Blackwell said. "Like I said, I was hoping it missed. But I kinda had a feeling it didn't. When I saw it, that's a whole different thing there when you see it." Across the highway, a building that once housed a general store that had been a Stoneburg staple for decades was in ruins, just down a gravel road from an auto salvage yard with a long row of burned-out cars. A metal auto repair shop next door still stood, but the torched inside included a vintage jeep. Parts of Stoneburg still smoldered Friday, including railroad ties under the tracks that dissect the town. A few miles away, the remains of about a half dozen head of cattle could were visible in a charred pasture. 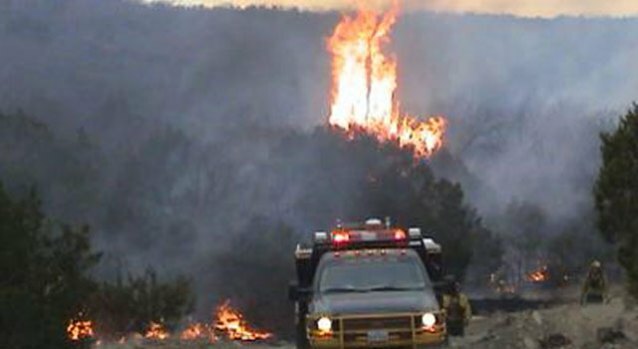 Firefighters battle a blazing wildfire on Thursday, April 9th. 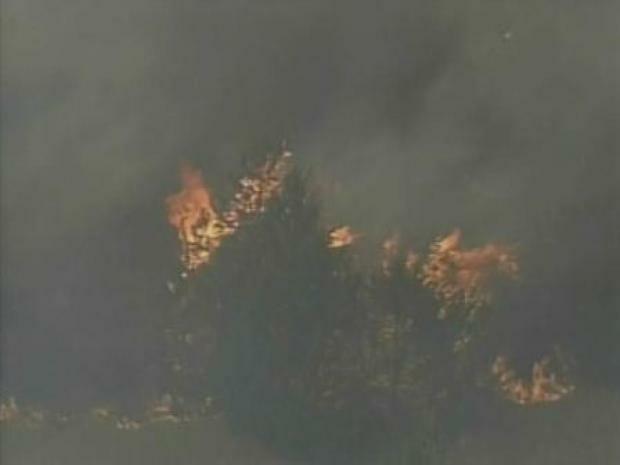 Firefighters were still battling blazes in other parts of Montague County, about 55 miles northwest of Fort Worth. Montague County Sheriff Paul Cunningham said one couple died when fire overtook their home near Montague and another woman died after calling for an ambulance as a fire spread through an unincorporated part of the county. Her cause of death was unclear. "We've lost communities, pretty much," Cunningham said. "Stoneburg is pretty much gone." Authorities identified the dead couple as former reporter Matt Quinn and his wife, Cathy. Matt Quinn quit ABC News after two years to join WFAA-TV of Dallas-Fort Worth in 1980 and retired in the early 1990s. Their son, Chris, was in fair condition with burns at Parkland Memorial Hospital in Dallas, the television station reported. "Things are starting to look a little better," Texas Forest Service spokeswoman Misty Wilburn said. "Today the Texas Forest Service is definitely on the offense, not on the defense." Gov. Rick Perry on Friday asked FEMA to issue an emergency declaration that would provide federal assets and resources for 199 threatened counties. Not far from Stoneburgh in Sunset, a town of about 350, buildings were destroyed Thursday in a seemingly random fashion. Some houses were blackened and burned to the ground, while others still stood and residents armed with garden hoses scrambled to save their homes. Fire Chief Alan Campbell said the high winds sent embers flying, resulting in the patchwork of fires. Tim Gortney was out of town when the fire swept in, but his home was untouched thanks to neighbors who fought the blaze. His mother-in-law who lives next door wasn't so lucky. Linda Freeman, 64, was returning from her job at a nursing home Thursday night when she saw the thick smoke everywhere and was told she needed to evacuate. She hurriedly grabbed a few pictures, then went to her son's house about 10 miles away where "he turned on the news and I saw my home burning." Friday, steel stairs that once led to her mobile home's front door were all that remained. Next to the stairs, the blackened hulk was so thoroughly burned that it was difficult to identify any personal items. "Everything she ever worked for is right there," Gortney said, pointing to the rubble. "It took her 60-something years to get it and about 20 minutes to lose it." Glenda Freeman said her mobile home burned to the ground, but she is still grateful. "I lost everything that I had except the clothes I had on," she said. "Thank God we got out when we did because you know it could've been worse." Campbell said nine homes were destroyed in Sunset. Wilburn said some of the fires around the state had been contained by Friday, but she didn't have precise figures. The fire spanning Young and Jack counties, which had destroyed at least seven homes and 36 other structures, was burning 28,000 acres and about 30 percent contained Friday. Wilburn said more than 120 homes had been evacuated. The Wichita County fire near Electra covered about 4,500 acres but 75 percent contained by Friday. It destroyed one agriculture company's buildings and warehouses, Sheriff David Duke said. About 800 residents and a nursing home were evacuated, but they were allowed to return home by Thursday evening. Help fighting the blazes has come from across the state and includes 67 fire engines from various fire departments, 37 bulldozers to cut fire lines, and 21 aircraft, including two Texas Military Forces Blackhawk helicopters and contract aircraft, the governor's office said. Widespread rain and thunderstorms are expected to descend on the North Texas region hardest hit by the wildfires by late Saturday, the National Weather Service said.